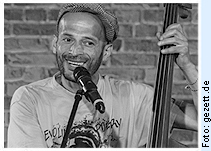 DGIZ (born in 1972 in Rennes, France) mixes Rap, Slam Poetry, music, comedy and improvisation. As the “poet of the modern world, spokesman of the city and dreamer of language” (Mouvement.net) he has been performing on French stages since 2004. In 2012 he gave his first concerts as an MC. His hip-hop is nonconformist, makes fun of itself, is honest and intelligent. Himself a double bass player, DGIZ has no fear of integrating acoustic instruments into his songs. In this way jazz sounds merge with hip-hop and Spoken Word on his albums and fuse to become urban poetry.